The official press release of the Diocese concerning the recent attacks of Christians at the Coptic Headquarters in Cairo, Egypt. The Coptic Orthodox Diocese of Los Angeles, lead by His Grace Bishop Serapion, vehemently condemns the attacks which occurred over the weekend, first in the north of Cairo city of Al-Khosous on Saturday, and later on Sunday, at St. Mark’s Cathedral, the Coptic Church’s official headquarters, in the Cairo district of Abbasiya, during the funeral of those martyred the day before. The impact of this attack on the Coptic Cathedral in Cairo has a far reaching effect on the Copts throughout the world, including the Coptic Christians here in America. The Cathedral is the international headquarters of the Coptic Church and the residence of our Pope, akin to the Vatican, the Roman Catholic headquarters. In the early hours of Saturday, April 6, five people were shot to death – and at least eight injured – in Qalioubiya’s Al-Khosous town. Four Christians and one Muslim were killed in the violence, Egypt’s health ministry reported. It has been reported that up to 6 Christians have died. At Sunday’s funeral services at St. Mark’s Cathedral, violence continued as unknown assailants attacked those gathered to bury those who died the previous day. One Christian was killed and over 80 others were wounded. 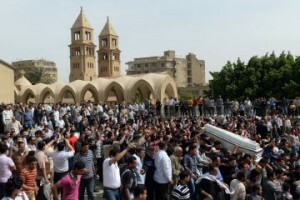 After being pelted with stones, mourners at the cathedral responded by throwing stones back. Gunshots were heard during the subsequent clashes; some eyewitnesses confirmed that assailants used firearms. Witnesses at the scene confirmed that tear gas canisters had landed inside the Cathedral’s precincts, fired by Egyptian riot police. Despite widespread attacks on Christians in Egypt, this is the first time that attacks have penetrated the cathedral since its doors opened in 1968.